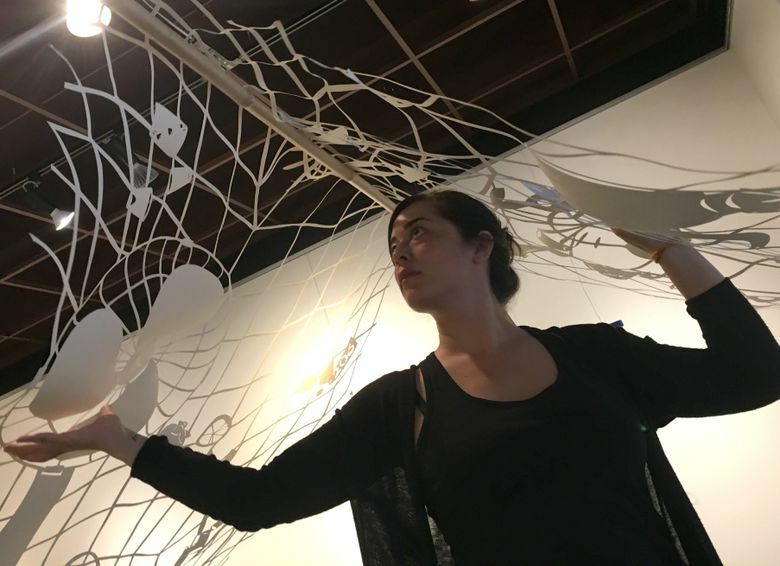 Lauren Iida’s exhibition at ArtXchange in Pioneer Square is a wondrous collection of ethereal cut-paper “webs,” entangling everyday objects in a net of memories that snares her grandmother, and adopted Cambodian uncle and other stories. Seattle artist Lauren Iida builds entire worlds from fragile paper cutouts. 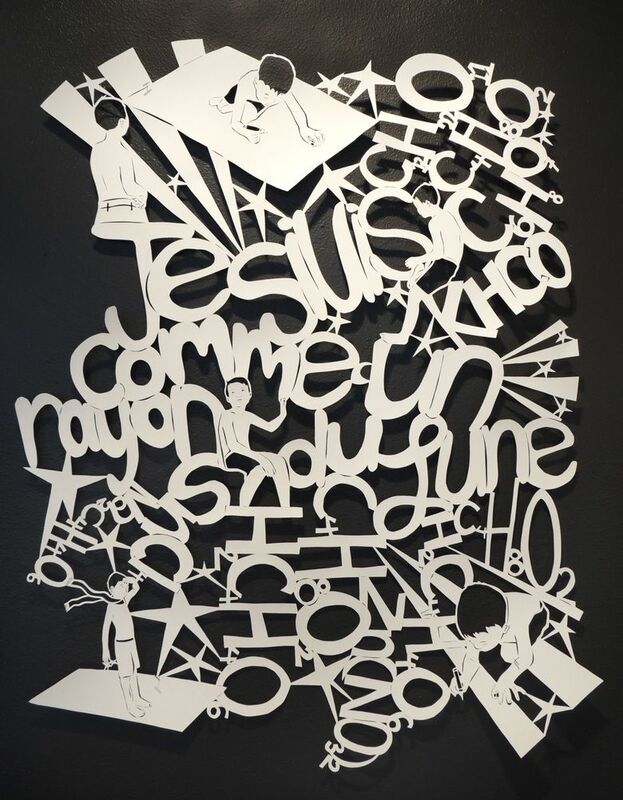 Her intricate hand-cut artworks depict everyday objects — electric fans, reading glasses, playing cards, etc. — to create magical webs of recollection. If these are “traps,” they’re highly seductive ones. And they all tell a story. 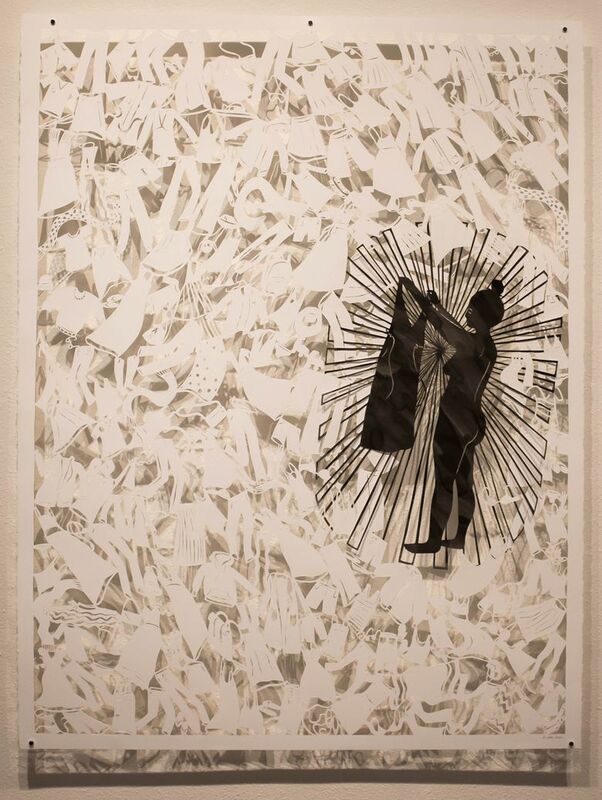 Indeed, every piece in “How to Trap a Memory” — her new show at ArtXchange Gallery — has a powerful narrative component. In a few cases, Iida even supplies written accounts of her creations’ sources of inspiration. 11 a.m.-5:30 p.m. Tuesdays-Saturdays through April 29, ArtXchange Gallery, 512 First Ave. S., Seattle (206-839-0377 or artxchange.org). The result is an elaborate and beguiling visual world that rewards lingering study. The closer you look, the more there is to see. 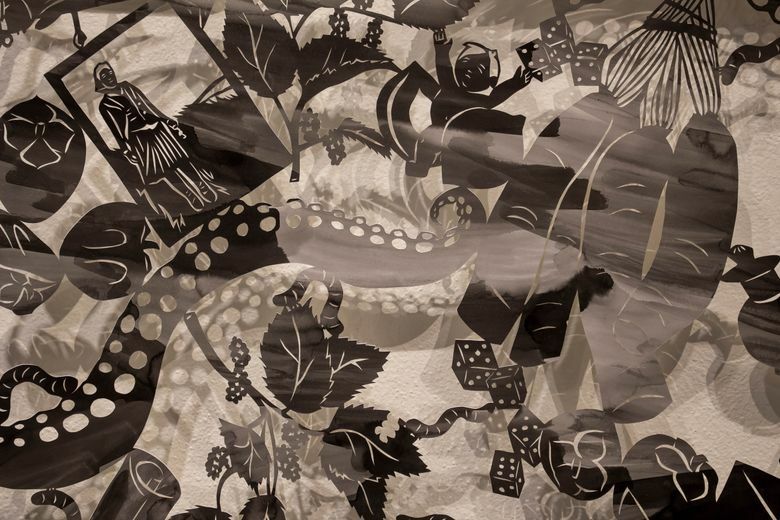 “Shared Histories (Tule Lake)” delivers a veritable cornucopia of detail with its lace-like paper forms. More than 3 feet wide and 4 feet high, it incorporates all sorts of bric-a-brac and memorabilia (food, chopsticks, mulberry leaves, an unopened letter, an unrolled scroll, rolled dice) as it draws on Iida’s girlhood memories of her Japanese-American grandmother’s West Seattle home. “Walking through these rooms for me was like entering a historical or natural history museum,” she writes in the essay accompanying the piece. While Iida doesn’t overtly comment on her grandmother’s World War II internment-camp experiences, the subtitle of the piece clearly alludes to them. Tule Lake was a “segregation center” where West Coast Japanese Americans were incarcerated. Some elements in the artwork vividly evoke internment-camp life, especially two “photographs” that have a 1940s feel to them. Iida’s meticulous paper-cutting technique does a remarkable job of suggesting old black-and-white snapshots. “The Strange Tale of the Magic Flying Whiteboard,” similar in scale and method to “Shared Histories,” is just as packed with lively detail, including chemical formulas, words in French and studious youngsters aboard something resembling flying carpets. Iida’s accompanying essay reveals that “Strange Tale” is a tribute to her adopted uncle Nan, a 48-year-old Cambodian man who, as a teenager under the Khmer Rouge, covertly studied French and chemistry. Decades later he achieved his dream of going to Paris, if only in his mind, by riding the whiteboard used in his adult-learning classes — “le tableau,” as he calls it. “It’s much easier to fly by le tableau than to fly by plane,” he told Iida, “because you don’t need money for gas.” Artwork and fanciful essay complement each other vivaciously. Other pieces, while as visually intricate, do just fine without overt explanation. “Hold On” shows a woman examining a dress she’d like to try on. She and the dress are rendered in black, with an aura of black rays highlighting their place in the image. The rest of the piece is a busy snow-white depiction of all sorts of clothing items: boots, bras, slacks, skirts, you name it … an entire costume department waiting to be put to use. “Death and Abundance” is also self-explanatory. 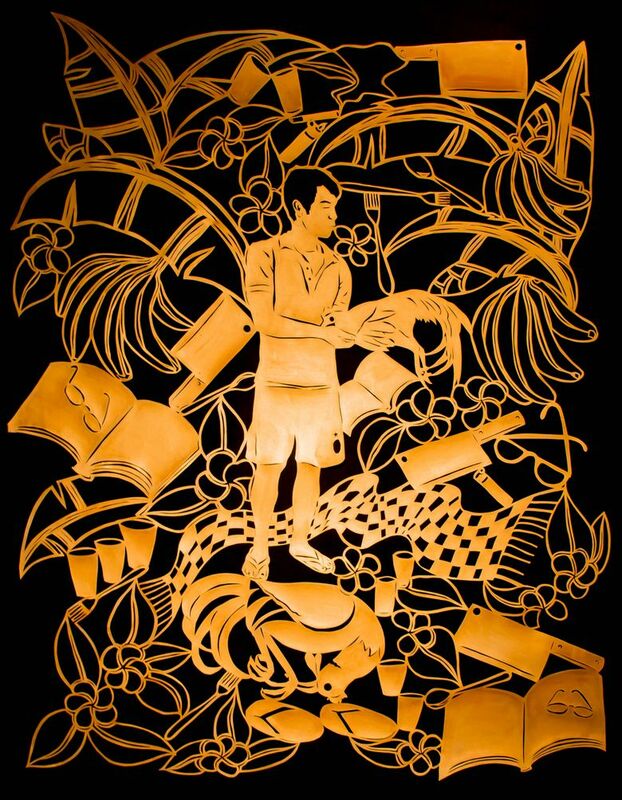 It shows a young Asian man with a cockerel in his hands, the bird clearly destined for the dinner table. Four meat cleavers and a trio of open books float around him, offering both the means of slaughter and, presumably, a choice of recipes. 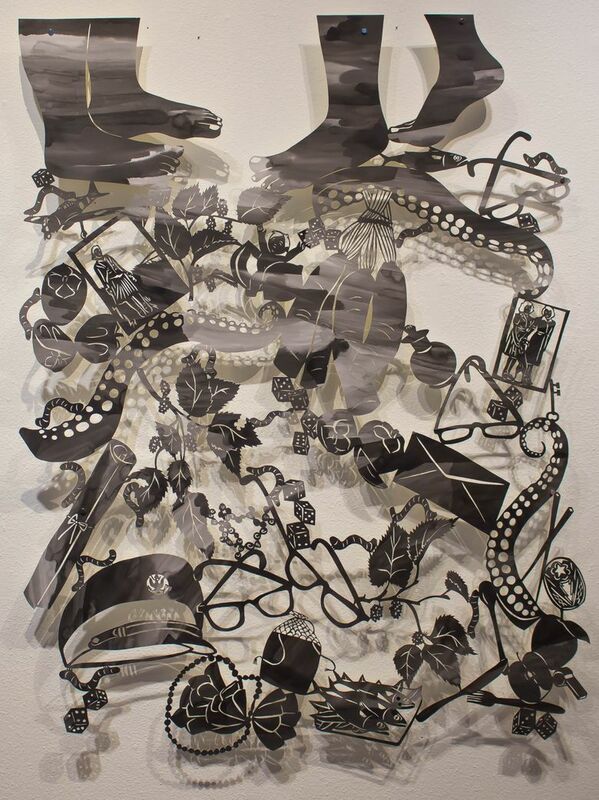 Several pieces use Sumi ink or acrylic paint to accentuate certain elements in Iida’s paper intricacies. But the centerpiece of the show, hanging overhead, is an unadorned white. It’s like a wedding canopy filling most of the gallery. “Memory Trap,” as it’s called, is 30 feet long and 4 feet wide. And its “trap” is open to anything: kitchen implements, keys, a large electric fan, a tube of toothpaste and plenty more. Here, the artist seems to say, is the life of the body and mind, past and present, all jumbled together. Its elements may be wildly various, but they’re inextricably linked. Whether working on a large scale or small, Iida conjures visions that entice you.